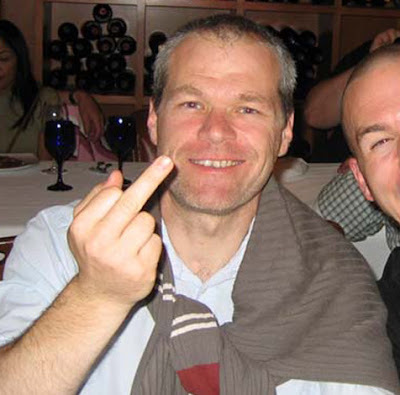 Uwe Boll, pictured above doing what he does best, isn't satisfied just making horrible movies, he's decided to make a horrible game. Debuting today on Gametrailers, 1968 Tunnel Rats puts players in the roll of a Vietnam era soldier apparently with rheumatoid arthritis as he walks, yes walks, through tunnels after Vietcong soldiers (read: oblivious looking guys in t-shirts) and hopping gaily over logs in the dangerous jungles of southeast Asia. The trailer shows a game with an abysmal frame rate and uninspired graphics. The writing shows that typical Boll flair. Pausing the trailer revealed lyrical gems like,"The Hueys are here Man! I knew this wasn't for long! I knew it couldn't be real!" Of course, the text in the trailer blackouts takes the cake. If you can stand if, check out the trailer. It's bound to hurt a bit, so brace yourself. If I know Uwe Boll though, there's bound to be a commentary track in the game. Listening to Uwe drone on about how wonderful and ingenious he is is the only thing that makes his films bearable. In fact, they're hilarious. If you have nothing else to do, rent a couple of his movies and listen to the commentary tracks. Pure gold.